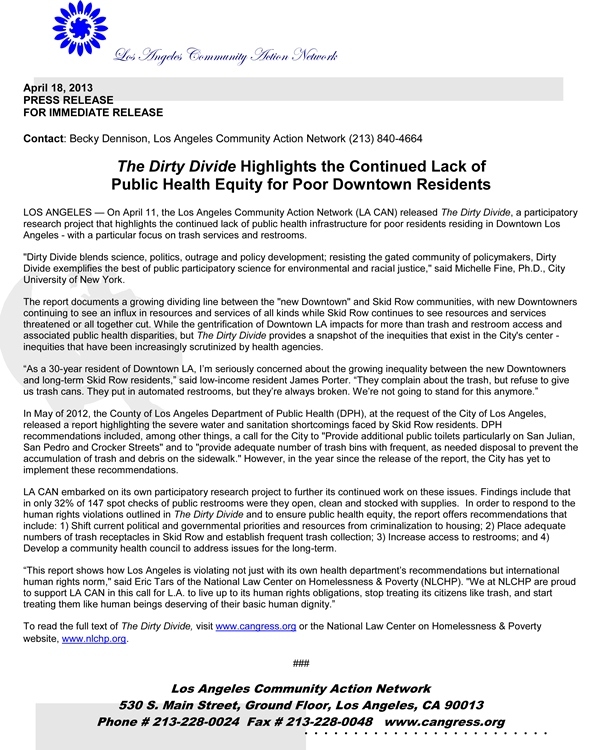 LOS ANGELES — On April 11, the Los Angeles Community Action Network (LA CAN) released The Dirty Divide, a participatory research project that highlights the continued lack of public health infrastructure for poor residents residing in Downtown Los Angeles – with a particular focus on trash services and restrooms. “Dirty Divide blends science, politics, outrage and policy development; resisting the gated community of policymakers, Dirty Divide exemplifies the best of public participatory science for environmental and racial justice,” said Michelle Fine, Ph.D., City University of New York. The report documents a growing dividi­ng line between the “new Downtown” and Skid Row communities, with new Downtowners continuing to see an influx in resources and services of all kinds while Skid Row continues to see resources and services threatened or all together cut. While the gentrification of Downtown LA impacts for more than trash and restroom access and associated public health disparities, but The Dirty Divide provides a snapshot of the inequities that exist in the City’s center – inequities that have been increasingly scrutinized by health agencies. In May of 2012, the County of Los Angeles Department of Public Health (DPH), at the request of the City of Los Angeles, released a report highlighting the severe water and sanitation shortcomings faced by Skid Row residents. DPH recommendations included, among other things, a call for the City to “Provide additional public toilets particularly on San Julian, San Pedro and Crocker Streets” and to “provide adequate number of trash bins with frequent, as needed disposal to prevent the accumulation of trash and debris on the sidewalk.” However, in the year since the relea­se of the report, the City has yet to implement these recommendations. LA CAN embarked on its own participatory research project to further its continued work on these issues. Findings include that in only 32% of 147 spot checks of public restrooms were they open, clean and stocked with supplies. In order to respond to the human rights violations outlined in The Dirty Divide and to ensure public health equity, the report offers recommendations that include: 1) Shift current political and governmental priorities and resources from criminalization to housing; 2) Place adequate numbers of trash receptacles in Skid Row and establish frequent trash collection; 3) Increase access to restrooms; and 4) Develop a community health council to address issues for the long-term. To read the full text of The Dirty Divide, visit www.cangress.org or the National Law Center on Homelessness & Poverty website, www.nlchp.org.